Time for a new turntable? Vinyl sales reached 3.2 million in 2016. But there are plenty of vinyl fans who don't have a turntable to go with their growing record collection. What are you waiting for? The last decade has seen a dramatic shift in how we listen to music. Last year alone over 3.2million LPs were sold. That's up from the 200,000 LPs sold ten years ago. It's a change, says the British Phonographic Industry, that's driven by the special sound that comes from listening on a turntable. Yet for all the people buying records, a third of them don't have a turntable to play them on. If, as the BPI says, it's all about the crackle that comes from playing vinyl, compared with a digital download, what are these music fans waiting for? 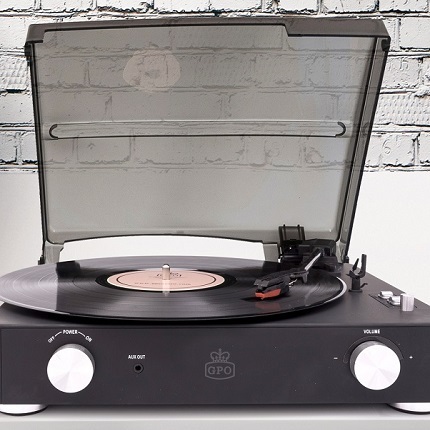 At GPO we make turntables designed to be both stylish and affordable. They're also designed to sit in the centre of your music collection and play everything. Music's about being flexible and listening in a variety of formats. While music fans are loving vinyl, they're also listening to music via digital downloads, on their smartphones or MP3 device. 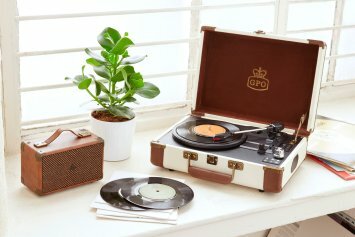 GPO makes record players that let you do all of that, and more. Take the GPO Bermuda. 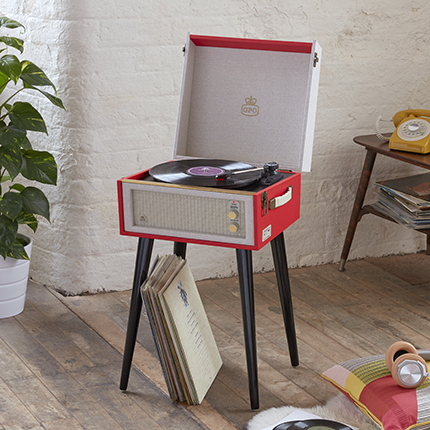 Based on the sixties classic Dansette, the Bermuda is a full sized three speed turntable. Retro-styled it has a cloth cover and speaker grill on the front. It can be carried, or use the screw in legs to use it as freestanding. While the turntable itself is designed for 33/45 and 78 speed records it isn't just for vinyl playback. 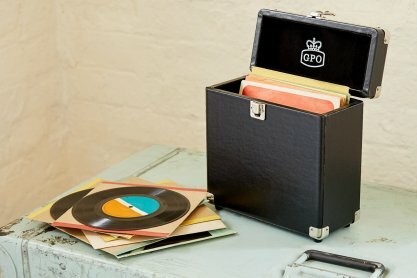 You can record all your vinyl to a USB stick for MP3 playback, or just to plug your USB stick and save your music on a computer. The Bermuda has built in speakers as well, so you can use that for your digital tracks as well as your LPs. 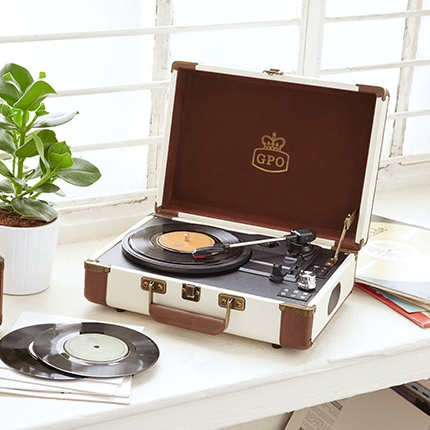 You can do the same with the GPO Ambassador, our first portable record player with Bluetooth. 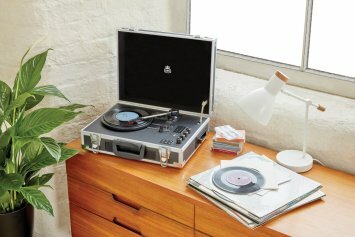 You can convert all your vinyl LPs to digital format using the USB stick and you can use the Bluetooth to connect to any Bluetooth device, whether it's a speaker or your smartphone or enabled MP3. The GPO Chesterton also has a tape deck, so as well as your vinyl, digital tracks you can also play cassettes from the music player as well. The vinyl revival is all about celebrating an old format. But that doesn't mean our turntable all have to be stuck in the past. 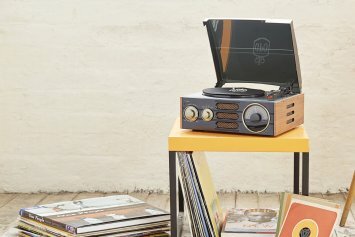 At GPO we believe a retro style can be fused with modern kit, and while our record players might look like they've come from another era, they're very much designed for the modern music fan. 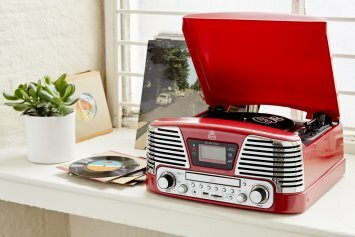 Play your vinyl and then plug in your MP3 or smartphone to play any of your digital tracks, or even play your cassettes. 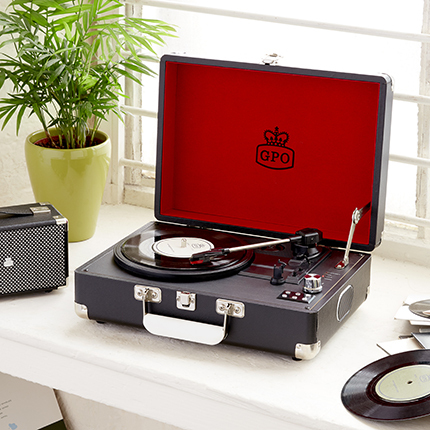 GPO record players are made for the whole of your music collection.